I'm sorry this isn't all that much of a post, but I promised to share a recent outing as (very modest, as it turns out) payback for all the fun posts others have put up here. I went downrigging for lake trout on the Adirondacks' Lake George a few days ago. Truth be told, I've never been much for trolling of any kind, I guess because I prefer a more intimate (if that's the right word) connection to the fish I'm trying to catch, but a buddy was visiting and he really wanted to experience this. 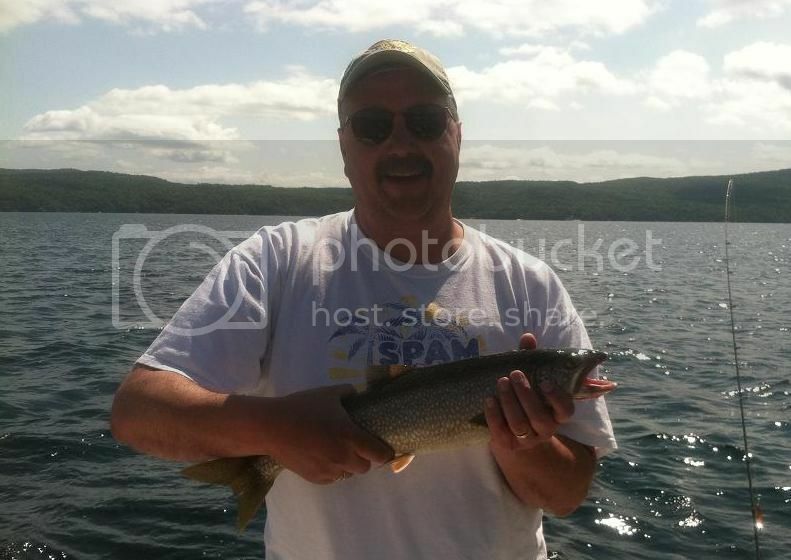 I reckon I did, too, as this was my first time downrigging and my first time going for lake trout - and any reason for a half-day out on "the Queen of American Lakes" is just fine with me! We kept our gear as light as we reasonably could despite how we were fishing, using 8 lb.-test monofilament on long, light-action rods, and that certainly added to the enjoyment. We ended up having to work for our catch, which was sparse: two smallmouth bass and two lake trout, none of which met the legal size limits for these species, in five hours. But that's ok. We were really only interested in catch-and-release, anyway, and it was a beautiful day. Mostly sunny with just a few clouds, scarcely any wind, cool temperature. Toward midday the wind picked up enough to cause at least a little wave action and I suspect that helped our cause, as that's when we finally caught fish. Yeah, you guessed it, a cold front had just gone through the area, and we were enjoying/suffering the results. When we burped him before release he showed us what he'd been eating, rainbow smelt about 2 1/2 in. in length. Anyway, that was my day! Thanks for the report Gerry! 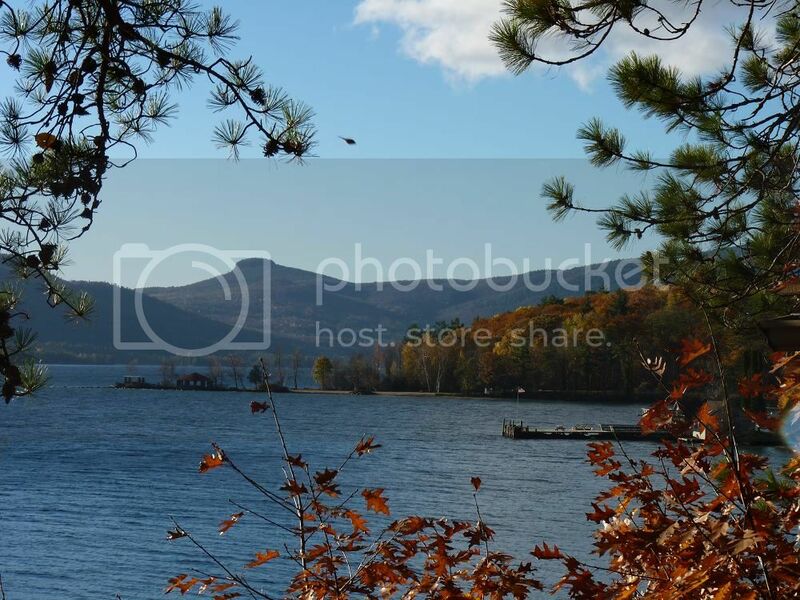 Lake George looks beautiful. are there any Muskies or Land locked salmon in the system? I'll take four fish on a calm sunny day anytime...especially if they include Smallmouths! When I was a student I bought all of my clothes from a local Goodwill because I was dirt poor and more importantly, I had a crush on the two pretty sisters that owned it and I didn't want them to go out of business and move away. In any event, one year I bought a hooded sweatshirt from them and it said: "My Grandparents went to lake George and all they brought me back was this stupid sweatshirt." I bet I had a hundred people ask me where lake George was and I never knew until now. Thanks for the fish report and geography lesson! There are indeed landlocked salmon in Lake George, Tim, and trophy-class northern pike, too; no muskies that I've heard of, though. Speaking of geography lessons: When I first met my wife, who was born in NY and whose family has been coming to Lake George every year since before she was born, I pretty much outraged her - yeah, that's about the right word for it - by referring to this region derogatorily as just another part of "the East Coast," which in my mind meant lots of buildings, roads and cars, and people, people, PEOPLE! In other words, a kind of hell on earth for anyone who loves wildlife and wild lands. Hey, what did I know? At that point I'd scarcely ever been more 100 miles east of the Mississippi and thought the 19th century's Horace Greeley had it right not just about Washington, DC but about the whole Eastern Seaboard. Sure, I'd heard of the Adirondacks, but I found it really hard to imagine how a truly wild mountain range could be squeezed in among all that humanity. So after we'd been together a bit she brought me up here to see her beloved Lake George, to climb one of the tallest of the High Peaks and to propose to me on the shore of one her favorite mountain "ponds" (which would qualify as a pretty big lake in most other parts of the country). I was sold, of course, and on much more than the region. Indeed, we were subsequently married right on the shore of Lake George, and by that point, like her, I couldn't have imagined doing it anywhere else in the world. Parts of AZ remain first in my heart, but the Adirondacks aren't far behind. Great scenery and story, thanks for sharing !